Since harvesting our bumper crop of winter squashes I didn’t really feel like I should be buying other vegetables. Then I found the perfect solution…..
We could have other vegetables as a first course. Lettuce season is long past. But we still, occasionally, want salad. Fortunately, it’s the start of Savoy cabbage season. I have so many house photos to post I decided to break with tradition and do the recipe first – for those who just come by for the food. I'm getting anxious for summer – and garden salads. 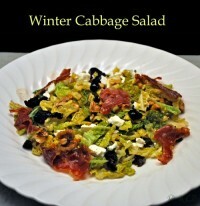 Until then I make winter salads.